Two of the touchstones for these new models of success are “lifestyle” and “integration.” Today we are going to bear down on the lifestyle component. What is lifestyle hotel mixed-use development all about? Some think that “lifestyle” is just the current incarnation of “boutique” and find that boutique is now passé. The boutique concept, which many think was invented by Kimpton and extended by others like Joie de Vivre and Morgans, originally implied a smaller hotel, with high levels of art and design, and highly personalized service. Boutiques usually had innovative signature restaurants and something distinctive — whether quaint or hip, stylish or lavish. Some argued that boutiques had to be fewer than 100 rooms, while others argued for more if the feeling of intimacy maintained. Then Las Vegas introduced boutique hotels of “only” 1,000 rooms. I guess that is “intimate” if compared to 5,000 rooms, but something gets lost in the translation. Well, the leaders of boutique — such as Kimpton, Joie de Vivre and Morgans — have all continued to advance their concepts. Maybe the word “boutique” is passé to some, but the inventors of the concept have continued to keep the idea fresh and appealing to big segment of travelers. Still, “lifestyle” implies something more than “just” distinctive, small, comfortable or hip. It suggests integration of component parts for a meaningful and exciting live-work-play environment. It is likely “ahead of the curve” and involves art, design, fashion, and dynamic and colorful environments that relate to a whole demographic segment. It is likely to be specialized and focused in order provide this differentiating quality – a quality that makes people feel “special,” “exclusive,” with a warm sense of personal belonging. 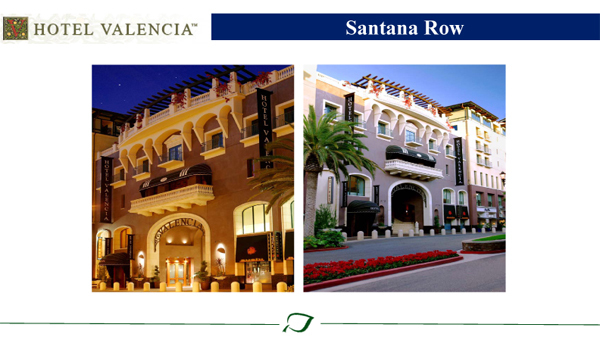 These photos of Valencia’s Santana Row illustrate how the retail, residential and hotel components of the hotel mixed-use project work together to provide an attractive and exciting “lifestyle” experience. So why the fuss over lifestyle in hotel mixed-use projects? Concepts of “lifestyle” cross asset classes. All real estate classes focus on “knowing your customer,” providing a distinctive product, and delivering a superior experience. Indeed, these principles have been the foundation of the retail, entertainment, and residential segments of the real estate industry for years. Maybe office and hotels are late to the concept, but the principles apply to all real estate classes, and when real estate uses, brands, and setting are properly selected, with similar focus, the results can be astounding. 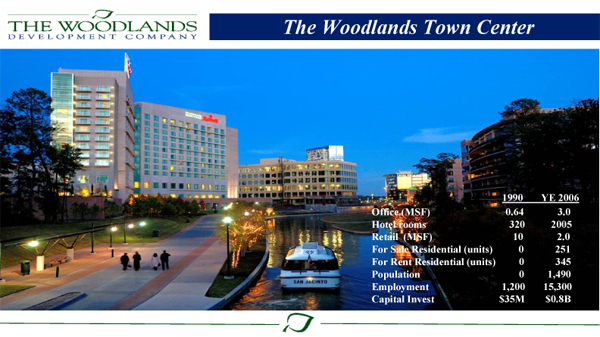 It is the right mix of real estate uses in a hotel mixed-use project that creates great value. That is why Marty Collins of Gatehouse reports that his W Hotels and Residence create a 50-100% value premium. 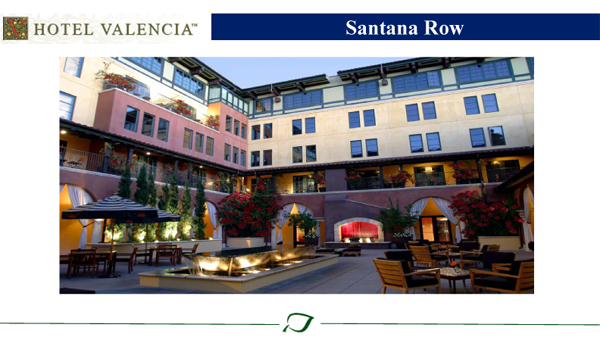 That is how Valencia reports a 150-180% RevPAR penetration at Santana Row and has generated record retail sales for the merchants in the project as well as their landlords. And that is why General Growth Properties (one of the largest owners of shopping malls in the world) is looking at its 200+ malls and retail centers to see where it can accomplish superior results — and believes that it may have identified 80 opportunities. How does the “IRR Premium” for hotel mixed-use developments work? Can it be measured or is it all “touchy feel-ey”? Understanding this in the terms of a specific project, like the Dallas Galleria Mall is an interesting exercise. 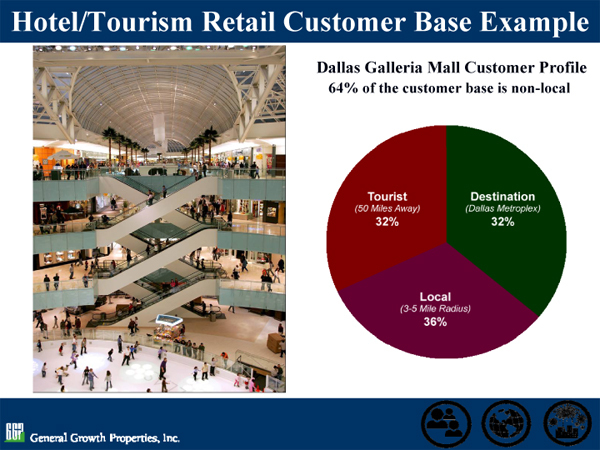 This chart shows how only 32% of the Dallas Galleria’s business came from local shoppers, and 32% of the business came from customers 50 miles away or more. What makes a customer come here to shop? 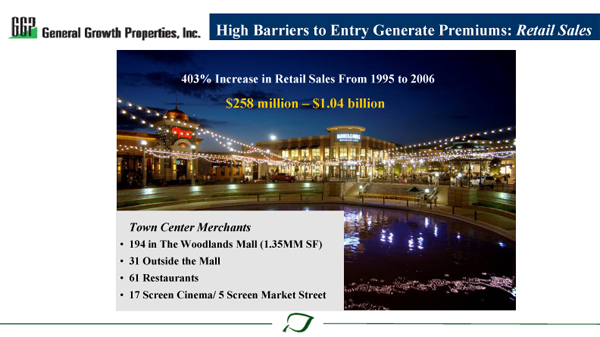 With more than 200 malls across America, General Growth spent a lot of resources understanding the synergies of hotel mixed-use. 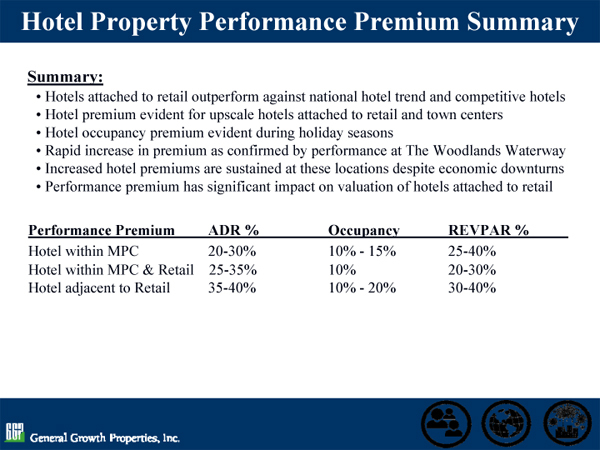 The chart below summarizes their conclusions as to the performance premiums for hotel mixed-use, where a) hotels are within Master Planned Communities (MPC), b) with an MPC and retail, and c) adjacent to Retail. But as I said earlier, the benefit of hotel mixed-use flows both ways — each component of the mixed-use project enhances and improves the other. 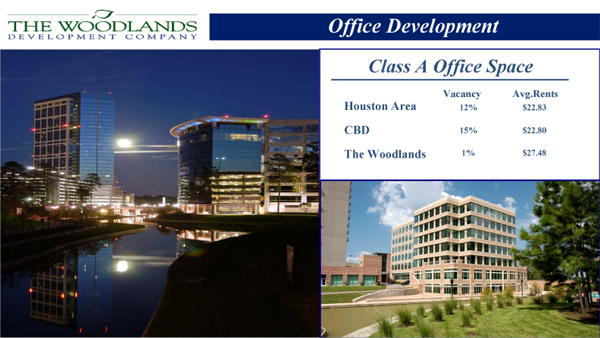 So here is GGP’s analysis of the enhanced performance of its office component at The Woodlands, their MPC in Houston. 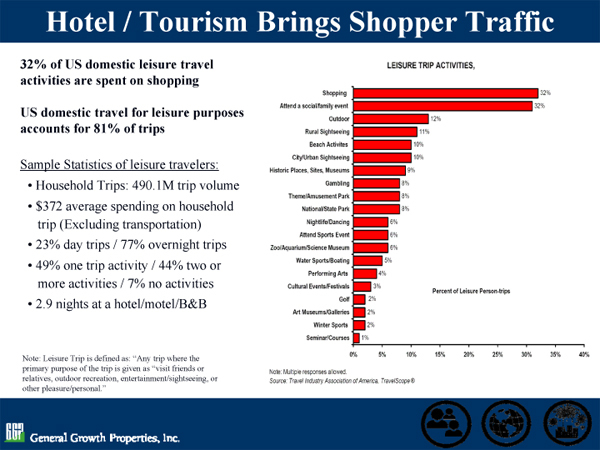 And if the earlier synergies of leisure travelers loving to shop were lost on you, here is a chart showing how GGP figures that its retail sales increased by more than 403% from 1995 to 2006 — at least in significant part because of the hotel mixed-use nature of the project (and also all the usual developer’s points of pride, including superior design, location, and exclusivity created in an MPC). The upscale shopping experience is also a vital component of Santana Row’s success, as is the dining, entertainment, and lodging. Hotel Valencia occupies a critical space in Santana Row’s urban oasis. 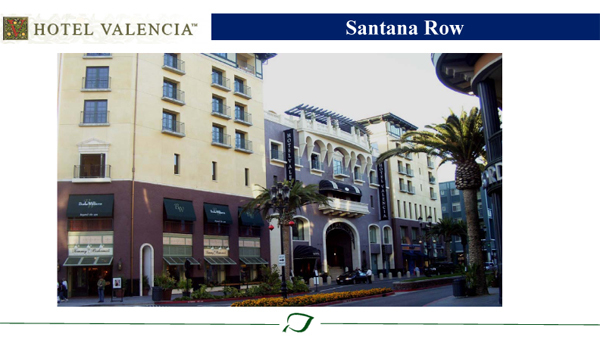 Inspired by the scale, mix, and feel of European boulevards, Santana Row offers a dynamic lifestyle experience. More than “just” a 212-room chic, contemporary hotel for discerning travels, Hotel Valencia Santana Row is at the very heart of this experience: “it is exactly where you want to be”. Hotel mixed-use can provide customers and guests with great experiences and provide owners and operators with exceptional value. But one size does not fit all. It is not a panacea! Like all successful projects, you have to do your homework. The results from successful hotel mixed-use projects — with enhanced values radiating from each component of the project to all others — can be absolutely compelling. It is documented. It can be dramatic and make the difference between rich profits and bankrupting losses. But it simply does not work everywhere. And there is an art as well as a science to making it work. How to terminate a hotel management agreement when an operator really deserves it! Hospitality Lawyer Baja Mexico — So what’s a brand? How did Trump get into this conversation? Jim devotes 100% of his practice to hospitality, representing hotel owners, developers and lenders. Jim leads JMBM’s Global Hospitality Group® — a team of 50 seasoned professionals with more than $87 billion of hotel transactional experience, involving more than 3,900 properties located around the globe. In the last 5 years alone, Jim and his team have assisted clients with more than 90 hotel mixed-use projects, all of which have involved at least some residential, and many have also involved significant spa, restaurant, retail, office, sports, and entertainment components — frequently integrated with energizing lifestyle elements.